Halloween is the day made for fantastically mucky creatures like the witch, the ghoul, the black cat and the troll. Personally, I've always had a certain fondness for the troll: His vibrant hair helped make him one of the most covetable toys of all time, and he was excellent in Harry Potter and the Sorcerer's Stone. But there are certain places you want to see trolls—like under a bridge—and certain places you do not. Social media falls into the latter category. A social media troll is an individual who disrupts normal discussion on social media by starting arguments or posting inflammatory, extraneous or off-topic messages with the deliberate intent of provoking others into an emotional response. "Trolls are a special breed," says Janet Fouts. "They look for high profile sites or people to grumble at...They play off anything you say in response." Social media trolls feed off inexperienced or underprepared social media managers, which is why many experts recommend disengaging from them entirely. But the answer is not always that simple. When the trolls are hungry, inaction can be worse than taking the bait. So how do you know the right time to intervene and the right time to let the trolls lie? We've created a helpful infographic to help you determine exactly that! 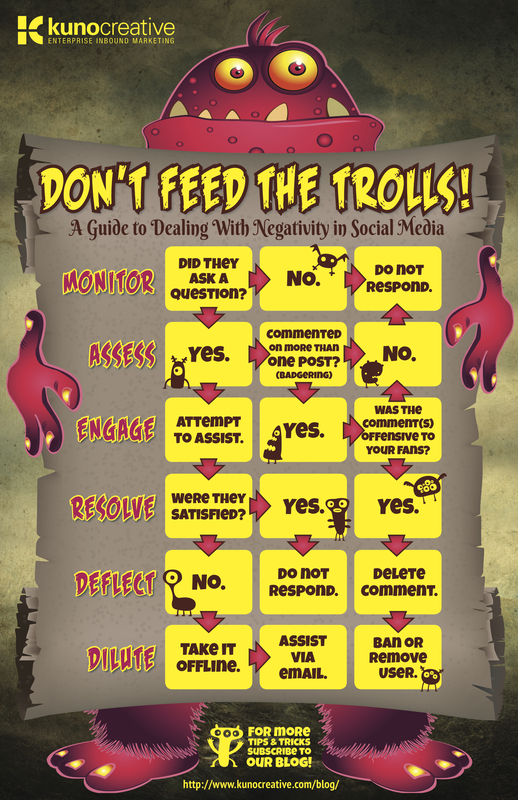 Save the workflow below, and the next time a bone-crunching troll wanders onto your brand's social media profiles, you'll be ready. This infographic is the brainchild of Kuno Creative Marketing Director Vanessa Knipper who often helps clients realize the bigger social media picture. Graphic Designer Jim Skidmore is the creator of the repugnant hobgoblin (and the other minions, too!). Want to see more of this dynamic duo's creative work? Download the free guide "101 Examples of Creative Facebook Content" today!